MIAMI — Nina Johnson Gallery is pleased to present A Very Happy New Year to You, the first exhibition to bring together a family of artists: brother and sister Joshua and Tisch Abelow, and their late grandmother Paula Brunner Abelow. Through an intergenerational selection of works, this joyful exhibition highlights the unexpected lineages of artmaking, the strange ability of painting to reach across the decades into the lives of others. A Very Happy New Year to You opens with a public reception on January 11, 2019 (6-8pm), and will remain on view until February 9. At the heart of Joshua Abelow’s multifaceted practice, which encompasses painting, drawing, writing, and curating, is how the artist plays with systems of artwork production and arrangement—setting up expectations as to how artworks function within a certain context, and then disrupting those expectations. 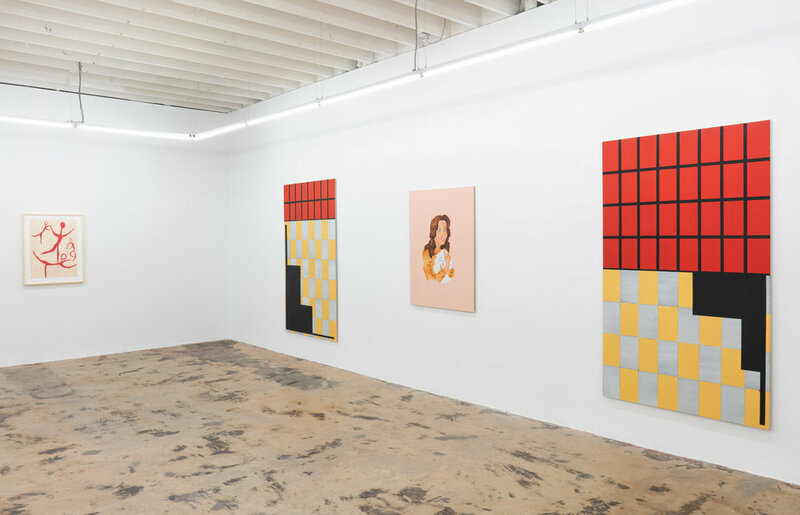 Here, three series relax the constraints surrounding geometric abstraction. 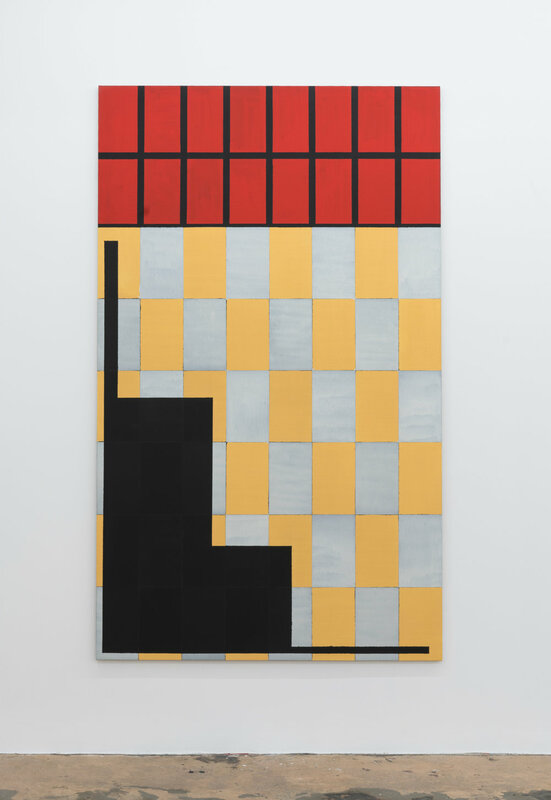 In three larger paintings, totalizing geometric systems crest against each other, holding the logic and aesthetic of each in an unsteady balance. 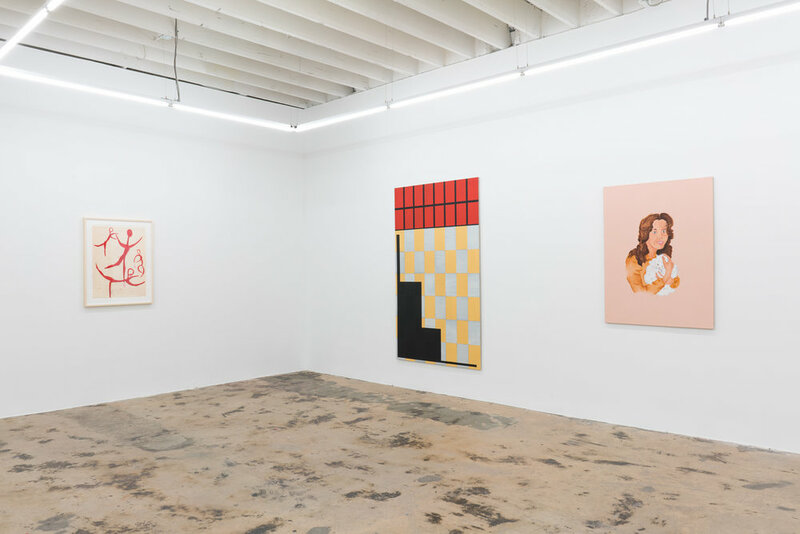 In several smaller works, a strict geometric composition is compromised by either the surface of the painting (the bleed between forms, the rough tooth of burlap) or by the intrusion of figuration: an open- mouthed face, rendered with a few painterly gestures. 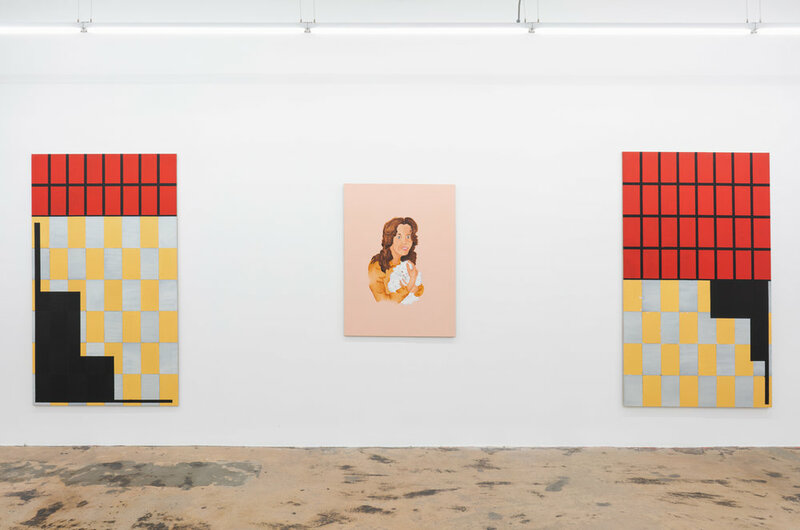 Since her enrollment at the New York Graduate School for Psychoanalysis, Tisch Abelow has been painting portraits in which the sitters float inside fields of color, or abstract compositions. The subjects come from old family photographs, or from images that are reminiscent of childhood memories. Grasping at the Uncanny, she uses portraiture as a guide through layers of memory and repression, working back through her family history. Though the figures are presented matter-of-factly, they exist within a psychologically uncertain space: either surrounded with the patterned trappings of feminine domesticity, holding a family pet just slightly too close for comfort, or staring across the void back at oneself. Paula Brunner Abelow was born in 1923 in Prague, where she lived until her family fled the Germans in 1938, first to Switzerland, then Mexico, and then finally the United States. In 1944 she enrolled at Cooper Union. Although she eventually left New York City for rural Maryland and then West Virginia, her work maintained the cosmopolitan avant-garde spirit of those travels. 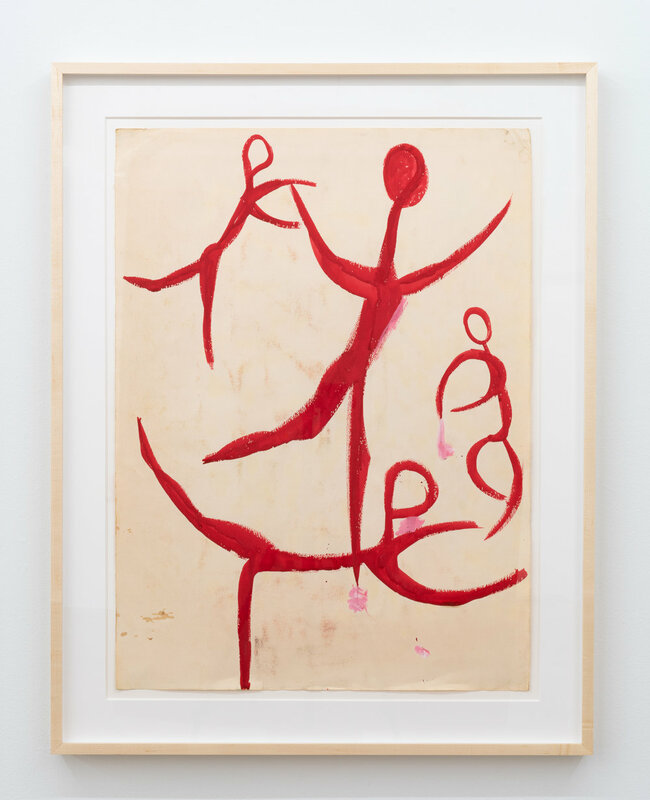 In the paintings on view here, which date from the 1940s to the 1970s, one sees an artist who grew up in the heart of modernity, and privileged its abstract impulse and open-ended treatment of form and material for the entirety of her working life. In their coy gestures, vibrant palette, and embrace of simultaneous modes of artmaking, the works feel contemporary, which is just another word for youthful, and the painting which gives this exhibition its name, A Very Happy New Year to You, sums up the hope and happiness with which she faced the future. This exhibition is a celebration of Paula Brunner Abelow’s life and art. She’ll be missed. Joshua Abelow (b. 1976) lives and works in Harris, New York and New York, New York. Abelow received his BFA from the Rhode Island School of Design (1998) and his MFA from the Cranbrook Academy of Art (2008). 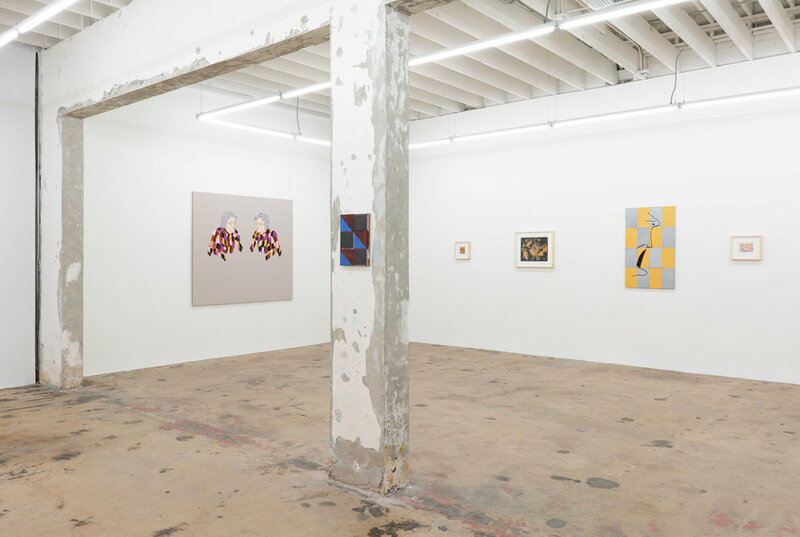 Abelow has exhibited his work at several galleries worldwide including solo shows at James Fuentes, New York (2011, 2013, 2016, 2018), Sorry We’re Closed, Brus- sels (2012), BFA Boatos Fine Arts, São Paulo (2015), Freddy, Harris (2016), Tif Sigfrids, Los Angeles (2016) and Halsey McKay, East Hampton (2017). In 2019 Joshua Abelow will have a solo show at Et al., San Francisco. Additionally, Abelow runs Freddy, a curatorial program, out of an old church in Harris, New York. Tisch Abelow (b. 1985) is an artist currently living and working in NYC. She received her BA from Sarah Lawrence College (2007) and is currently a MA candidate at NYGSP. 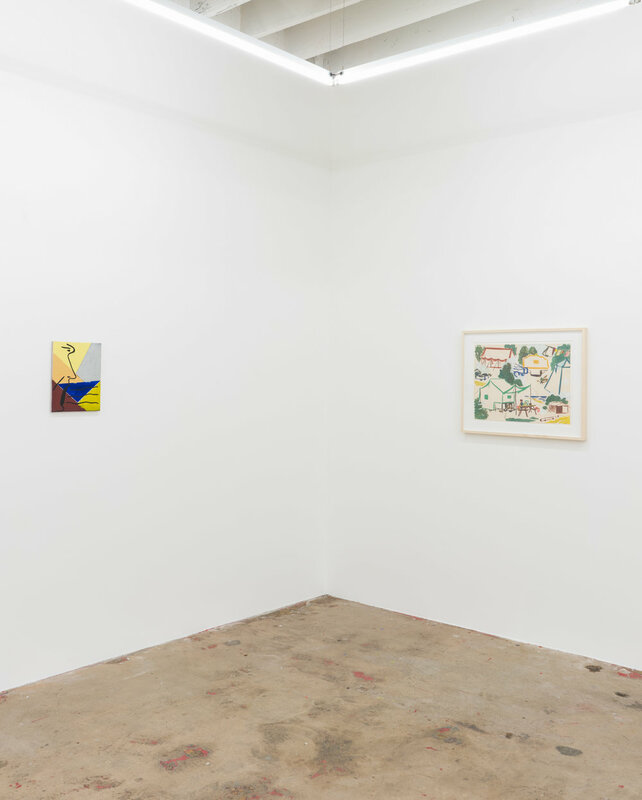 Her work has been included in group shows at numerous galleries such as Jack Hanley, New York, 247365, New York, and Interstate Projects, Brooklyn. 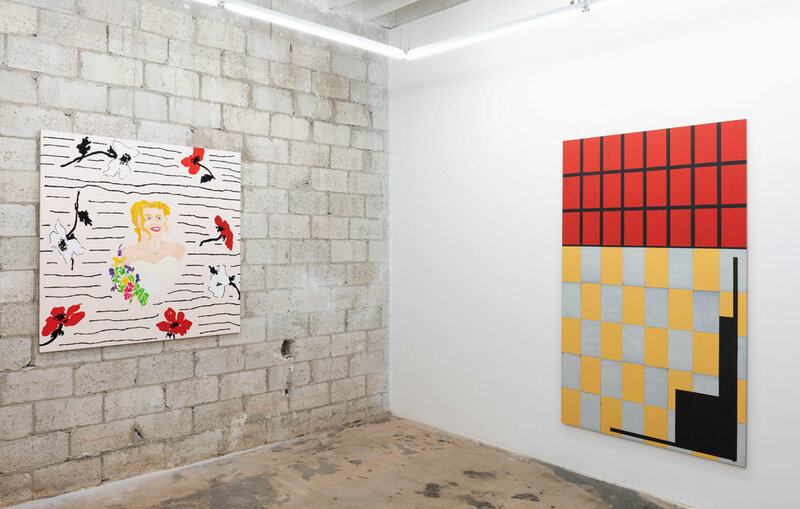 She had two-person exhibitions with Peter Harkawik at Freddy, Baltimore (2014) and with Dakotah Savage at Essex Flowers, New York (2016). 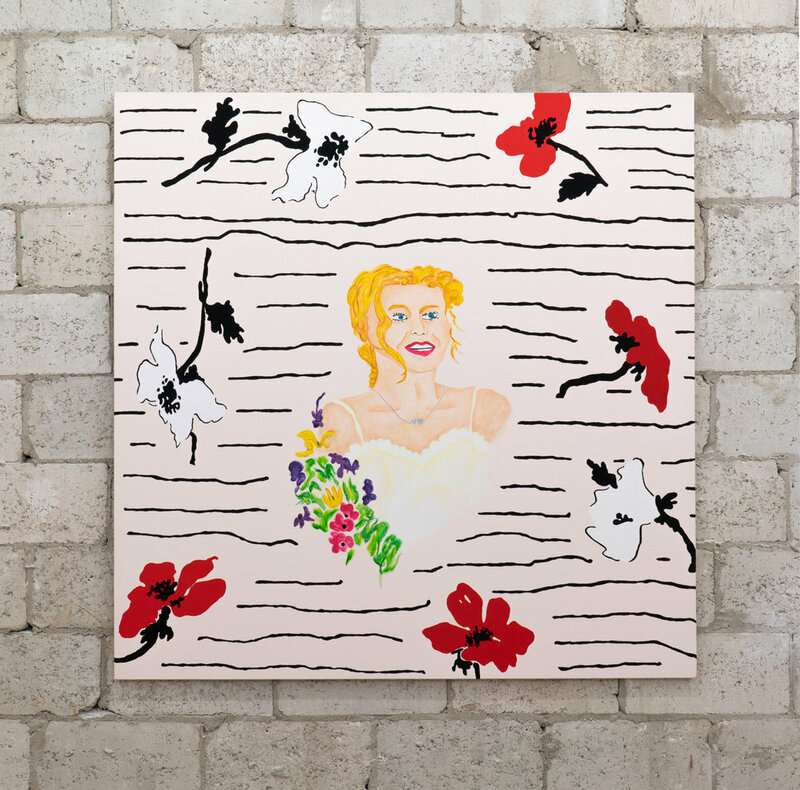 Abelow curated exhibitions at ART BLOG ART BLOG, New York (2011) and at The Hole, New York (2014). 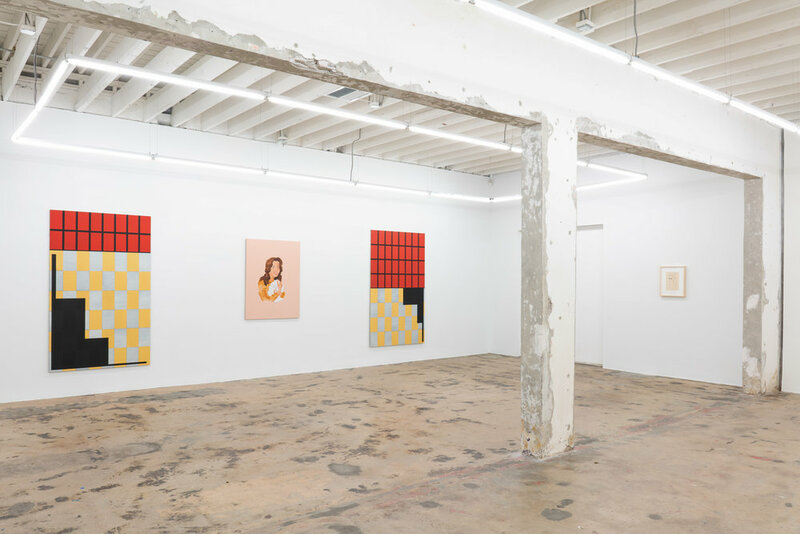 She had her first solo exhibition at Michael Thibault Gallery, Los Angeles (2014) and currently has a solo show at Baba Yaga, Hudson, NY (2018/2019). Paula Brunner Abelow was born in 1923, Prague, former Czechoslovakia, and she lived and worked in Charles Town, West Virginia, United States. The artist studied at Cooper Union from 1944-1948 and was later granted a BFA in 1981. Over the years, Paula’s work was featured in numerous exhibitions in Baltimore, Washington D.C., Frederick, Hagerstown and Bel Air, Maryland as well as in Martinsburg and Shepherdstown, WV. In 2013, her work was included in the Prague Biennale, Czech Republic. In 2014, she had a solo exhibition at Lucie Fontaine, Milan, Italy and in 2016 she had a mini retrospective exhibition at Freddy, Harris, NY. 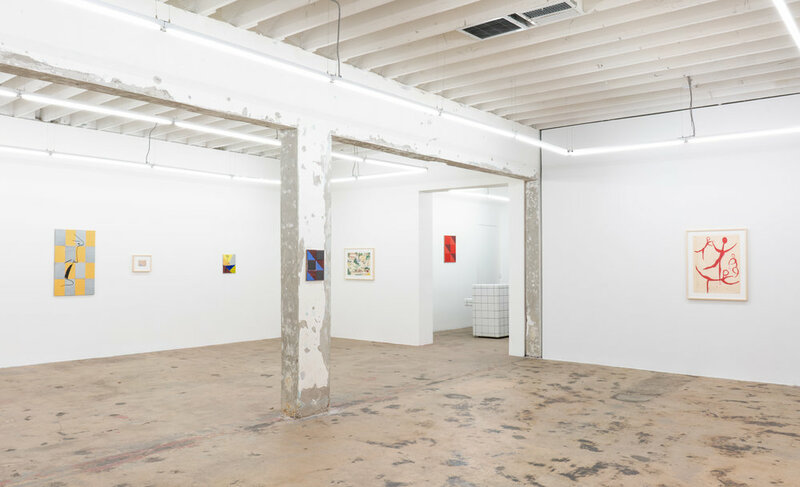 Additionally, in 2016, her work was included in a group exhibition titled, The Congregation, curated by Joshua Abelow, at Jack Hanley Gallery in New York City. She passed away near her home in West Virginia on August 31, 2018, just shy of 95.